The Graduate Management Admission Test (GMAT) is a test that has been produced by the Graduate Management Admission Council (GMAC), and is used to help business schools in making admissions decisions. It is taken by students who are applying for admission to either MBA or other graduate management programs. The test is given in English only, and it tests analytical writing, integrated reasoning, quantitative, and verbal skills. 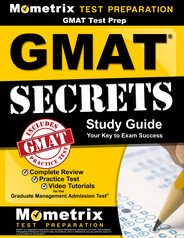 The GMAT is always taken on a computer, and, with the exception of the essay, is in multiple-choice format. Prepare with our GMAT Study Guide and Practice Questions. Print or eBook. Guaranteed to raise your score. Get started today! There are several ways a person can register for the exam. Registration can be completed online on the GMAC website or by phone by calling 1-800-717-GMAT. Registration can also be completed by mail. If registering by mail, the official scheduling form needs to be downloaded from GMAC’s website, filled in, and mailed to Pearson VUE. The address to which to mail this form is indicated on the website. When registering, all necessary fees must be paid as well. GMAT Flashcards. 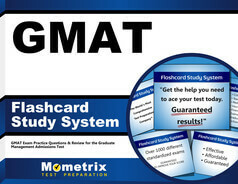 Proven GMAT test flashcards raise your score on the GMAT test. Guaranteed. If registering by phone or online, fees must be paid with a debit or a credit card. If registering by mail, fees can also be paid with a cashier’s check, a personal check, or a money order. All fees must be drawn on US banks, in US dollars. Fee details are all outlined on the website. The GMAT test consists of four sections. The first section of the test is the Analytical Writing Assessment (AWA). The test-taker is given 30 minutes to write an essay analyzing an argument. Until recently, test-takers had to write to essays. In 2012, however, one essay was scrapped and replaced with the Integrated Reasoning section. On the Integrated Reasoning part of the exam, there are 12 multi-part questions about graphics interpretation, multi-source reasoning, two-part analysis, and table analysis. The time allotted for this portion is also 30 minutes. The Quantitative section tests the knowledge of arithmetic, elementary algebra, and common geometry through questions on data sufficiency and problem solving. There are 31 multiple choice questions in this section, and test takers have 65 minutes to complete these questions. The Verbal section has 36 multiple choice questions, and the questions test reading comprehension, critical reasoning, and sentence correction. This section also has a 65 minute time limit. The GMAT test is largely a computer adaptive test. This means that the multiple choice questions in the Quantitative and Verbal sections are adjusted to the ability level of the test taker. (The Analytical Writing and Integrated Reasoning sections are not computer adaptive.) Specific details on how the computer adaptive test process works can be found online at GMAC’s website. Because the computer test system will not advance to the next question until the person answers the current question, all questions must be answered. In cases where the answer is not known, it is therefore necessary to make an educated guess. It is also imperative that all test questions are completed. Therefore, proper pacing throughout the exam is necessary. There are five separate scores on the exam. Each section is scored individually, and there’s also a “Total” score. The Total score is not based on all four sections, but only the Verbal and Quantitative numbers. The Verbal and Quantitative sections of the GMAT test have scores that range from 0 to 60. These two raw scores are then converted to an overall Total” score that ranges from 200 to 800. This is the “GMAT score” most people are familiar with. Two thirds of all test takers will have a Total score between 400 and 600. The scores in the Verbal and Quantitative sections are determined by several things: the number of questions answered, if the questions were answered correctly or incorrectly, and the level of difficulty of the questions answered, as well as the statistical nature of the questions. The Integrated Reasoning section is scored from 1 to 8. The Analytical Writing Assessment is scored by two independent essay readers. These readers score the AWA on a scale from 1 to 6, and the scores from each reader are averaged to come up with an overall sore. The overall score ranges from zero to six, in half point increments. If the scores from the independent readers vary by more than one point, an expert essay reader is used to help determine the final score. The GMAT test covers a wide range of topics. Make sure that you are prepared for a mental marathon on the day of your exam. A lot of test takers preparing for the exam end up spending thousands of dollars on test prep courses when they would probably be better off with a couple of study guides and practice tests. Make sure that you monitor your pace while taking the test.